GlenLakes Country Club is a private master-planned community situated on 1,400 acres of native terrain that encompasses clear lakes, ancient oaks and towering pines. This gated neighborhood retains the integrity of its immaculate Nature Coast setting. Well-lit quiet streets and broad landscaped boulevards lined with palms blend into the pristine landscape and lead to welcoming individual neighborhoods of custom-designed homes and characteristic villas. Located in proximity of St. Petersburg, Orlando and Tampa, the development is within minutes of major shopping venues, fine and casual dining establishments, and many cultural activities. A 24-hour manned gatehouse provides peace of mind by maintaining a comforting level of security. GlenLakes Country Club is open to buyers of all ages. One of the major highlights is the private golf course with its emerald fairways. 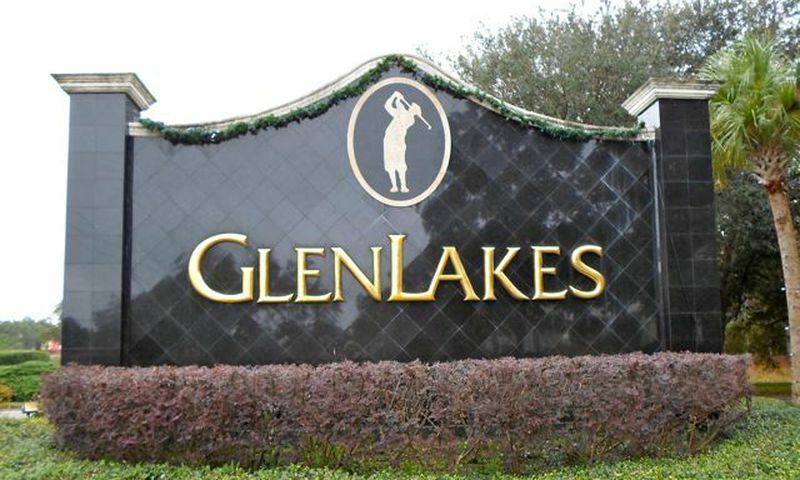 Membership is available to all residents of GlenLakes Country Club. Designed by Ron Garl, the meticulously maintained 18-hole championship golf course winds throughout the community. Fairways framed by mature oaks and pines lead to an Aqua driving range and multi-tiered teeing areas. While golf is a major pastime of the community's residents, a 35,000 square-foot clubhouse functions as the activity hub of GlenLakes Country Club and provides even more opportunities for recreation and fitness. In addition to a fitness center with aerobics and dance studio, other indoor amenities include a restaurant, grill room, and banquet facilities as well as cards and crafts rooms. The grounds contain a pool and clay tennis courts. Development of GlenLakes Country Club started in 1995 and will continue until the community has completed its 1,500 homesites. This subdivision is comprised of individual villages that feature their own color schemes and architectural details. The numerous builders represented include Addison Homes, Alexander Homes, Palmwood Builders, and Arthur Rutenberg Homes. Many homesites border preserved land, golf course, or lakes for desirable all-around views. Buyers searching for new construction options are currently able to select from single-family estate homes and maintenance-free residences by Addison Homes. Estate Homes are larger than the maintenance-free homes, which are constructed on homesites ranging in sizes from 1/3 to 1/2 acre. They offer 1,901 to 3,065 square feet with two or three bedrooms, two to three-and-a-half bathrooms, and an attached two-car garage. The maintenance-free homes range from 1,620 to 2,345 square feet of living space. They have two or three bedrooms, two or three bathrooms, and an attached two-car garage. These detached homes come with lawn and exterior-home maintenance included. All Addison residences include upgrades like brick paver driveways, tile roofs, tray and crown moldings, and granite kitchen counter tops. GlenLakes has an extremely active lifestyle with a busy clubhouse and a full array of social activities. The community has friendly neighborhoods and different home styles to suit individual tastes. In addition, buyers can customize their lifestyle options by purchasing a homesite with lake front, golf course, or wooded views. Situated one hour north of Tampa, GlenLakes in Weeki Wachee is outside of the hustle and bustle of big city life, but still within the center of everything. Residents are three miles from Highway 50 and nine miles from the Sun Coast Expressway. This prime location allows for easy access to shops, restaurants, medical facilities and entertainment venues. One popular destination is nearby Brooksville, which is home to assorted specialty shops. Another favorite is the community of Spring Hill just a short three-mile drive away. There, residents will find commercial areas that fulfill all the needs for daily conveniences. In addition, the community's proximity to the Gulf of Mexico provides plenty of opportunities for swimming, fishing and leisurely strolls along the beach. There are plenty of activities available in GlenLakes Country Club. Here is a sample of some of the clubs, activities and classes offered here. These single-family homes range from 1,620 to 2,345 square feet of living space. They have two or three bedrooms, two or three bathrooms, and an attached two-car garage. These detached homes come with lawn and exterior-home maintenance included in the HOA fee. These homes are available as new construction or resale. Estate Homes are available as new construction or resale. They range in size from 1,901 to 3,065 square feet. They have two or three bedrooms, two to three-and-a-half bathrooms, and an attached two-car garage. These homes are available on a resale-only basis. Please Note: Floor plans are not available at this time. Just bought an older resale house here and put about $20k into updates. It's turning out great and I think it was a really good investment. There are some really nice larger homes here that keep their value really well. The community is private and gated with its own private golf course. 55places.com is not affiliated with the developer(s) or homeowners association of GlenLakes Country Club. The information you submit is distributed to a 55places.com Partner Agent, who is a licensed real estate agent. The information regarding GlenLakes Country Club has not been verified or approved by the developer or homeowners association. Please verify all information prior to purchasing. 55places.com is not responsible for any errors regarding the information displayed on this website.